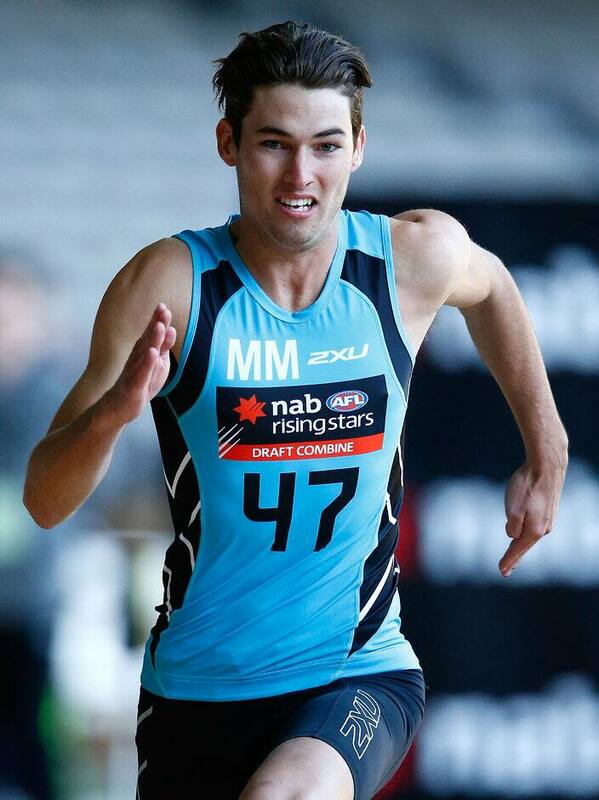 THREE possible first-round picks shared top place in the beep test in a busy day three of testing at the NAB AFL Draft Combine. Victorians Jarrod Berry and Oliver Florent, and West Australian key defender Griffin Logue all reached level 15.1 in the shuttle run, which was the final event of a jam-packed Saturday at Etihad Stadium. Berry's performance was another reminder of the 2015 All Australian's great athleticism, while Florent's effort showed he can match his pace and class with a strong endurance base. Logue's performance was perhaps most impressive, with the athletic key back pushing himself to exhaustion in his final run of the afternoon. Some recruiters see him as a possible top-20 pick given his size and ability to move around the ground. Hyundai Help for Kids Lions Academy player Jacob Allison was another player to remind people of his excellent athletic profile, running 2.87sec to take out the 20-metre sprint test ahead of Ben Ainsworth (2.90) and Josh Rotham (2.92). Jacob Allison takes over the best sprint time of the combine with a 2.87 second run over 20. Brisbane Lions academy product. Ainsworth again placed in the top group of performers for the agility test, which was won by North Ballarat prospect Tom Williamson. The skillful medium defender recorded a time of 8.15sec. The jumps tests were also completed under the watchful eyes of clubs at Etihad Stadium, with Jordan Gallucci's leap of 89cm in the standing vertical jump breaking the all-time record. The speedy midfielder's background in volleyball makes him a vibrant prospect and his jump overtook the record held by American Marvin Baynham (88cm in 2014). Possible No.1 pick Andrew McGrath led the way in the running vertical jump off the left foot with a leap of 96cm, while Logue was best on the right side with a lift of 91cm. The combine concludes with the 3km time trial on Sunday before the attending prospects have another set of interviews with clubs.